EKF Diagnostics announces that results from a study involving EKF Molecular’s PointMan™ DNA enrichment technology have been published in Clinical Cancer Research , a journal of the American Association for Cancer Research which focusses on innovative clinical cancer research studies. The study comparing tumor biopsy with noninvasive blood-based analyses brings together experts from four major US cancer centers involved in the ‘Stand Up to Cancer’ program - Massachusetts General Hospital, Harvard Medical School, The University of Texas, and Weill Cornell Medical, NY. PointMan DNA enrichment technology was used within the study for the highly sensitive detection of genetic variations in circulating tumor cells (CTCs) in blood samples from non-small cell lung cancer patients. In September 2014, EKF announced a two year research collaboration with Massachusetts General Hospital to develop PointMan assays that can effectively detect treatable cancer mutations in blood samples. This study shows that, subject to further clinical validation, liquid biopsy (tumor typing using blood as the sample source) is a realistic diagnostic opportunity with significant advantages over tissue biopsy. The study, entitled “Detection of T790M, the acquired resistance EGFR mutation, by tumor biopsy versus non-invasive blood-based analyses”, focused on identifying the epidermal growth factor receptor (EGFR) T790M mutation, which is associated with resistance to certain cancer drug treatments, using alternative methods to invasive tissue biopsies. The study identified the T790M mutation from a standard lung biopsy and then compared these results with tests on blood samples containing CTCs or circulating tumor DNA (ctDNA) from the patient’s cancer. 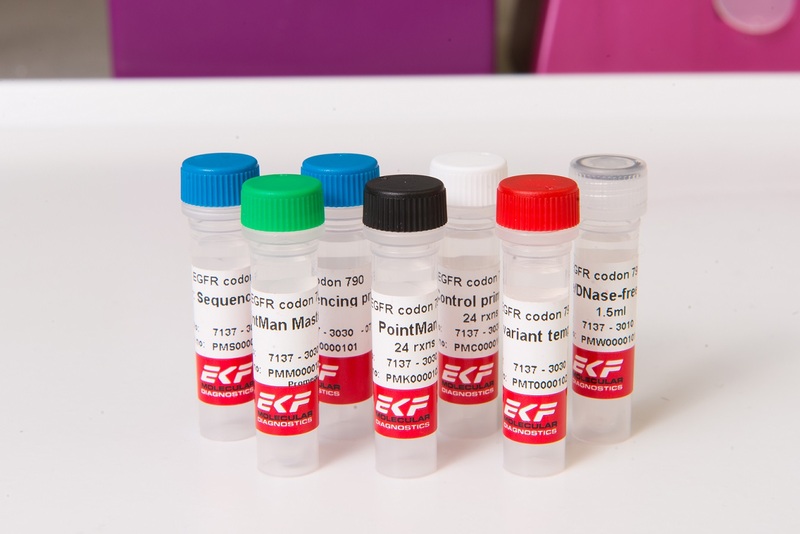 The T790M mutation from the CTC samples was enriched using EKF Molecular Diagnostics’ PointMan EGFR T790M DNA enrichment kit to enhance the sensitivity of the test procedure allowing accurate genotyping to take place. A successful outcome of this research would be key for those developing novel EGFR inhibitors capable of overcoming T790M associated resistance, whereby clinicians will be able to use regular blood tests to monitor progress rather than painful and intrusive lung biopsies.